at or before or any time after the marriage of the said parties but does not include dower or mahr in the case of persons to whom the Muslim Personal Law (Shariat) applies. In this connection the expression "valuable security" has the same meaning as in Section 30 of the Indian Penal Code, 1860. As per Section 30 of the Code the words 'valuable security' denotes a document which is, or purports to be, a document whereby any legal right is created, extended, transferred, restricted, extinguished or released, or whereby any person acknowledges that he lies under legal liability, or has not a certain legal right. Here, a reference may be made stridhan, as most ancient texts of Hindu Law have always been categoric that dowry as commonly understood, was stridhan and thus in the exclusive ownership of the bride. Manu enumerates the following six kinds of stridhan. 2. Gifts made at the bridal procession, that is, says katyayana while the bride is being led from the residence of her parent to that of her husband (Padavandanika). 3. Gifts made in token of love, that is, says katyayana, those made through affection by her father-in-law and mother-in-law (Pritidatta), and those made at the time of her making obeisance at the feet of elders (Padavandanika). 4. Gifts made by father. Later on some other items have been added to mean Stridhan. However when a distinction is made between 'Dowry' and 'Stridhan' it is said that the meaning assigned to 'Dowry' under Section 2 of the Dowry Prohibition Act, 1961 is much wider than the concept of stridhan. While dowry signifies presents given in connection with marriage to the bridal couple as well as other, stridhan was confined to 'property given to or meant for the bride'. If any person, after commencement of this Act, gives or takes or abets the giving or taking of dowry, he shall be punishable with imprisonment for a term which shall not be less than five years and with fine which shall not be less than fifteen thousand rupees or the amount of the value of such dowry, whichever is more. Provided that Court may, for adequate and special reason to be recorded in the judgment, impose a sentence of imprisonment for a term of less than five years. However, 'any presents which are given at the time of marriage to the bride or the bridegroom without any demand having been made in that behalf and such presents are of a customary in nature' shall not be considered to constitute 'giving or taking dowry'. Such customary presents should be entered in a list maintained in accordance with the Rules made under this Act and the value thereof should not be excessive having regard to the financial status of the person whom, or on whose behalf such presents are given. Section 4 of the Act also makes penal provisions for demanding dowry. 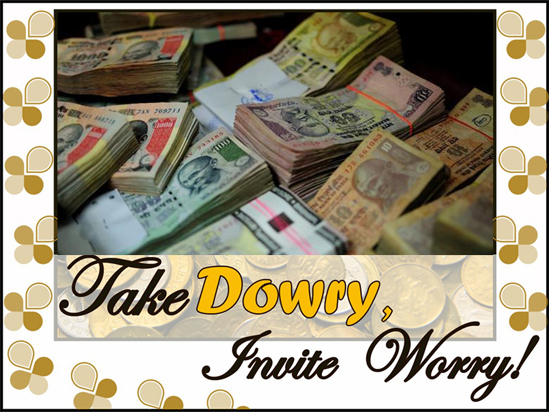 The very purpose of this section is to discourage the demand of dowry i.e. property or valuable security as a consideration for the marriage between the parties. Thus, as per the provision of the Section if any person demands, directly or indirectly any dowry from the parents, guardians or other relatives of a bride or bridegroom shall be, punished with a minimum imprisonment of six months which may extend up to two years with a fine extending up to ten thousand rupees. Section 304-B of the Indian Penal Code, 1860 deals with 'Dowry Death'. This new Sec.304-B was inserted in the code by the Dowry Prohibition (Amendment) Act, 1986. 1. Where the death of a woman is caused by any burns or bodily injury or occurs otherwise, than under normal circumstances within seven years of her marriage and it is shown that soon before her death she was subjected to cruelty or harassment by her husband or any relative or her husband for ,or in connection with any demand for dowry, such death shall be called 'Dowry Death' and such husband or relative shall be deemed to have caused her death. 2. Whoever commits dowry death shall be punished with imprisonment for a term which shall not be less than seven years but which may extend to imprisonment for life. CRUELTY BY HUSBAND OR HIS RELATIVES FOR DOWRY. Section 498-A of the Indian Penal Code punishes the husband or his relatives who subject a married woman to cruelty. The section was introduced by the Criminal Law (Amending) Act,1983 to combat the menace of Dowry deaths. By the same act Section 113-A has been added to the Indian Evidence Act to the effect that when a married woman commits suicide within a period of seven years from date of her marriage the court may presume that such suicide is abetted by the husband or his relatives.Thus it raises a presumption regarding abetment of suicide by a married woman.
" Whoever, being the husband or the relative of the husband of a woman subjects such woman to cruelty shall be punished with imprisonment for a term which may extend to three years and shall also be liable to fine. "The State and National Commission for Women, District and State Human Rights Protection Cell, Mahila P.Ss. and Sishu Desks in the Police Stations have been established to create awareness against Dowry and to provide legal aids to the victims. The women in large numbers now come forward to lodge complain against dowry related crime especially due to awareness and publicity by different media and non Govt. organizations". The Dowry Prohibition Act 1961. The Dowry Prohibition (Orissa Amendment) Act, 1976.